Hi, friends! A certain someone in our family just turned 30, and as he is quite the outdoorsy type I thought he would get a kick out of this lumberjack from the Stampin' Up Wood You Be Mine stamp set. I must say that I had much fun making this card, and I'm very happy with the way it came out. I hope he likes it, too! 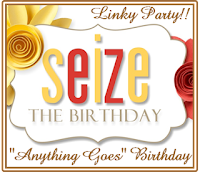 With this card I'm playing along with the Anything Goes challenge at Seize the Birthday. Hah, I LOVE this....I really didn't care for Mr Lumberjack when I first saw him, but he's kinda cute the way you have him fixed up here! Family member will like him too, I'm sure! The inside is fun, too! Such a fun card...that set makes me smile. Great card Sandy, perfect. I bet your someone loved the 30's all over the inside. Ha. Ha. What agreat masculine card! Love that you decorated the inside of the card! The sentiment is perfect! This is a fabulous masculine card!! Love the colouring and accents. Thanks so much for joining us at Seize the Birthday!